When Corinth and Megara, both allies of Sparta went to war, Athens sensed opportunity and soon formed an alliance with Megara. It precipitated the First Peloponnesian War (c 459 – 445 BC) and Athens soon turned the alliance into control of Megara. When peace returned, so did Megara into the Spartan fold. In 1941, Nazi Germany broke its non-aggression pact with the Soviet Union and launched the massive Operation Barbarossa against it. In both instances, the violators paid dearly. By the end of the Peloponnesian wars, a long saga, Athens had been reduced from its preeminence as the most powerful Greek state to a defeated vassal of Sparta. We know what happened to Germany. In one case it took over fifty years, in the other just four. History may not repeat itself but here we are in the 21st century and another agreement is about to be broken. Visiting leaders from France and Germany, UK’s Theresa May on the phone …. all have advised against such a course and all to no avail. Donald Trump insists on pulling out of the Iran deal. Every 120 days he is supposed to sign a waiver to lift sanctions related to the nuclear deal. Signing in mid-January, he warned it would be the last time unless the agreement was changed. The major European leaders have failed to dissuade him, and have now gone so far as for one to call his decision insane. They are right for the consequences could be disastrous, particularly as Iran continues to fulfill its obligations under the deal which keeps a check on any development of nuclear weapons. First for some background: Starting with the US invasion of Iraq, the political order in the Middle East arranged by Britain and France post World War I quickly disintegrated. National borders became porous, and state institutions severely stressed due to civil war or through non-state actors like ISIS — although the latter has been greatly weakened the ideology remains — and Syria has faced a multi-pronged insurgency. Out of chaos rather than design, Iran has emerged a key player. By offering help to Syria and Iraq and through aid to Hezbollah in Lebanon, Iran’s influence now extends over a wide swathe of the Middle East, from the Gulf to the Mediterranean. Moreover, in Yemen, it has pinned down the Saudis in an expensive civil war against a popular (Houthi) rebellion to which it has provided a measure of support. If this implies Iran is highly militaristic with a huge military budget, one could not be more wrong. In 2016, the latest year for which figures are available, Iran spent $12.7 billion on defense whereas Saudi Arabia laid out $63.7 billion, about five times more. So how has Iran succeeded in magnifying its influence? Not surprisingly, it has been a blundering US, staggering around like a drunken giant trampling any semblance of order. In the Iraq war, it overthrew a government and nation that was a countervailing force against Iran, and put in place an elected one which, given Iraq’s Shia majority, was Shia. Some of the Shia leaders had sought refuge in Shia Iran from Saddam’s efforts to keep this majority at heel. In this they had common bond with the Kurds up in northern Iraq, who fighting for an independent Kurdistan, had been gassed by Saddam. The Shia government in Iraq now looks to Iran. For example, last year the Kurds held a vote on independence from Iraq to form a separate Kurdistan. The Kurds voted for independence laying open the real possibility of civil war. It was Iran with its muscle in the region who dissuaded the Kurds, even forcing them to surrender Kirkuk, a city with a mixed Kurd and Arab population, to the central government. Then Saudi Arabia’s rejection and organized boycott of Qatar left it little choice but to seek closer ties with Iran, with which it has common natural gas interests. For Iran, it is a first foothold across the Gulf, right next door to Saudi Arabia’s oil, which happens to be in a Shia-majority province. In Lebanon, Iran has long supported its Shiite brethren, whose awakening dates to the 1980s Israeli invasion and its refusal to leave the South. First forming Amal to protect their rights, this downtrodden minority is now the most powerful force in Lebanon, now well-known as Hezbollah. It has been successful against Israeli arms twice. First, in forcing them to eventually leave southern Lebanon in 2000 — Israel’s interest was the water from the Litani river — and a second time when Israel attacked Lebanon in 2006 and Hezbollah forced it to pay a high enough price that withdrawal became the sensible option. Iran’s stock in Syria has soared both through the help given to Assad’s forces by Hezbollah but also through a substantial contribution by its revolutionary guards. This battle hardened force in concert with the tough Hezbollah and the Syrian army form the ground forces to compliment Russian air power. Together they have given President Assad victory and made Russia the arbiter in the region. The alliance has also been helped by a disaffected Turkey, wary of US help for Kurds, and the antagonistic, fundamentalist, and now also threatening, Saudi Arabia, which has become close to Israel. A harbinger of things to come was the Sochi meeting between Vladimir Putin, Turkish President Recep Tayyip Erdogan and Iranian President Hassan Rouhani on the future of Syria. The US was notable only in its absence. Russia is now actively wooing Turkey, and any belligerence by the Trump administration towards Iran will only draw it too closer to Russia, perhaps even signing a defense pact, although Iran would prefer neutrality. Aside from religious kinship and its use of proxies to protect itself from the Saudi bloc, Iran has also chosen to develop sophisticated missiles, a comparatively cheaper alternative to huge military expenditures. These ensure an attacker will pay a heavy price, and is one good reason why Benjamin Netanyahu would rather the US do the dirty work while he continues to make inflammatory and deceptive speeches about Iran. Unfortunately at present, the US is also exposed. Worse, its vulnerability is in a region where Iran holds a better hand. 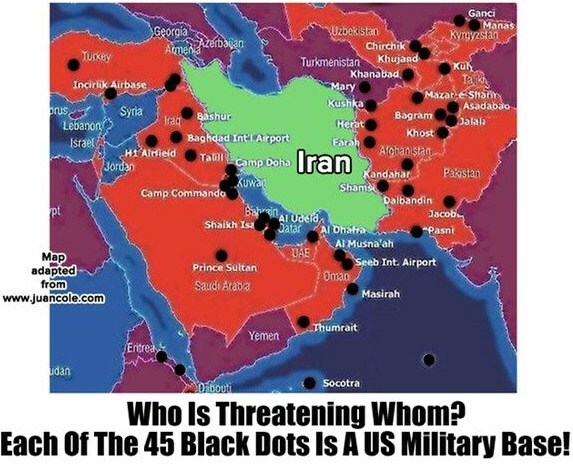 Moreover, a seriously destructive attack on Iran will bring back chaos to the whole region and sow the seeds for another ISIS and/or similar group(s) with the potential for exporting their philosophy to Europe and North America. What this analysis shows is exactly what the Europeans have been telling Mr. Trump. It makes sense to talk while maintaining the current deal. “Jaw, jaw is better than war war,” said a statesman (Churchill) whose bust occupies a prominent position in Trump’s office. More and more it becomes clear that the Navo/nato pact is a criminal organisation. More and more Europe is forced to get back to its own values and getting at distance from the USA.